There are few subjects more apt to generate heart palpitations and sweaty palms than math. For many of us, math is a time bomb of anxiety — loaded with memories of standing before a blackboard, clutching a piece of chalk and wondering if spontaneous human combustion was a viable option. Investigations, a research-based curriculum developed in Cambridge, Mass., focuses on building conceptual foundations while supporting a variety of learning styles. Students explore an area of content for weeks, practicing the idea through a variety of contexts and games, such as “Go collecting,” a Go Fish–style game that uses numbered trading cards in order to estimate sums and teach categorization. Other popular math programs used in the Puget Sound region include enVisionMATH, Jump Math, Everyday Math and Singapore Math. Jump Math, a program developed in Canada, breaks math down into tiny, digestible parts — painstakingly explaining each step before moving onto the next. The program also employs a lot of pictures to illustrate concepts. For example, students are asked to color a number of spots on a dog, match numbers to pictures of soccer balls, join numbered dots to form pictures of sailboats and circle numbers of hamsters. Singapore Math, another slower-paced curriculum based on the national methods used in Singapore, was designed with the philosophy that the purpose of math is to solve complex problems. Singapore Math places a focus on problem-solving, model drawing and use of complex word problems to answer “why,” rather than teaching rules outside of context. Students are asked to consider problems from different perspectives; instead of being asked to multiple height and width to find the area of a rectangle, they’re asked to find the side length of a square that has the same area as an 8-by-2 rectangle. enVisionMATH, used by the Lake Washington School District, places an emphasis on interactive and visual-based learning, and was built by following state standards. The program provides for differentiation instruction, the practice of tailoring lesson plans to students based on their skill level and grasp of concepts. “enVisionMATH is such a good program because it is designed for learners of all abilities and learning styles,” says Matt Manobianco, associate superintendent for student and professional learning services for the district. 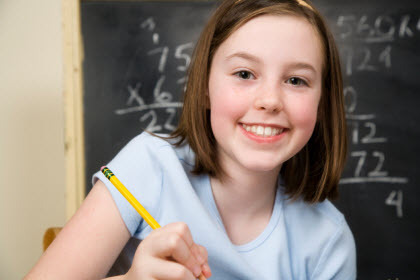 Math fluency, the ability to recall basic math facts from memory, is the cornerstone of the enVisionMATH curriculum. Seattle Public Schools uses Everyday Math, a program that incorporates peer discussions, math games and lessons tailored to multiple ability levels, as well as a greater emphasis on concepts over computation. “Seattle schools chose Everyday Math because it is a research-based curriculum that helps students make conceptual sense of mathematics, solve problems, and apply math skills, facts and procedures,” says Dan Gallagher, the math and science program manager for the district. Since its inception in the late ’90s, Everyday Math has been a source of controversy. With its de-emphasis on manual arithmetic and its attention to math concepts and problem-solving, this approach might sound like a welcome change. However, some parents and educators feel this method doesn’t provide enough focus on basic computation skills. The nonprofit group Washington STEM has committed to advancing math and science education statewide by offering grants and investments, supporting teachers in ongoing education and advocating policies that benefit those core competencies. Preparedness in STEM (science, technology, engineering and math) disciplines has gained a lot of attention in recent years, particularly after studies emerged that show U.S. students falling behind many of our global competitors in these subjects. As of 2011, the Program for International Student Assessment ranked the U.S. 23rd in math and 31st in science out of the 65-nation pool. Apart from average scores, the U.S. also had one of the smallest groups of individuals with top scores in math. President Obama has taken notice, announcing this past July that he plans to create a Master Teacher Corps to raise the bar in math and science education. The program would identify top STEM teachers nationwide and reward them for their efforts with additional funds. The teachers would then share their methods and expertise with their peers in the field. No program is without its champions and naysayers, however. Parents, educators and researchers bring their own emotional responses and learning styles to the table. Even evidence-based educational models can’t take into account all the differences in the ever-evolving student populations — from learning styles to confidence levels to cultural differences. Numerous studies have shown that people learn in a variety of ways, with categorizations such as “visual,” “auditory” and “kinesthetic” differentiations that merely scratch the surface of the many ways students are wired. No single teaching method is going to reach all students equally, and some kids will likely fall through the cracks for a host of reasons. And educators agree: The stakes have never been higher to keep kids on track. As technology and the world around us change, our need for math, and particular types of math, will keep evolving and adapting to meet the needs of future employment. In a nimble society of innovation and research, expect to see an ever-increasing divergence of teaching styles and methodologies. Ultimately, when it comes to teaching math, there is no magic formula.